Placing a heartfelt advertisement in leading defense publications gave U.K.-based Serco the exposure they needed in the American market. 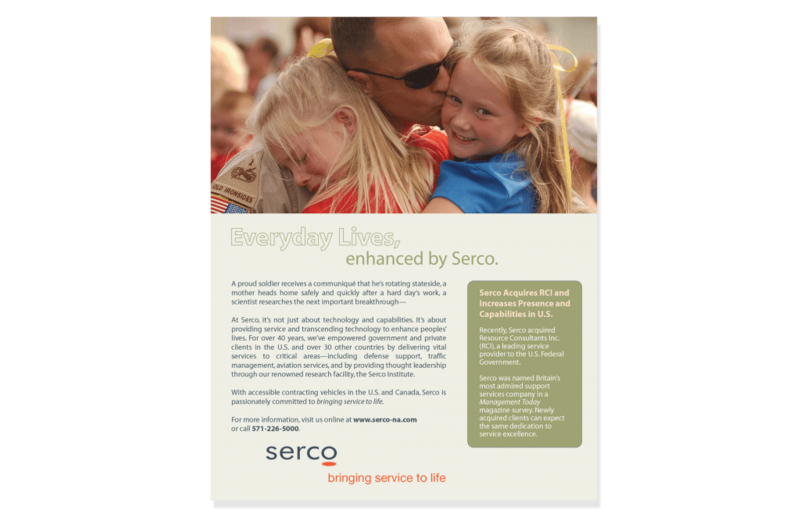 When Serco, one of the U.K.’s largest public sector contractors, acquired U.S. defense company Resource Consultants Inc., it sought a streamlined advertising campaign to facilitate the brand transition. Aware of the stakes in a hyper-competitive defense arena, Serco entrusted Borenstein Group to get its message to the market. Recognizing the need to firmly orient Serco’s brand in American service, Borenstein Group created an emotional campaign emphasizing Serco’s delivery of life-saving support services to U.S. soldiers. Placed in leading defense and government publications, the ad garnered valuable brand exposure among the Washington cognoscenti. With the creation of the campaign the Borenstein Group created, Serco was able to emphasize on its comprehensive end-to-end delivery to life saving support services to U.S. Soldiers and expand its footprint from the initial market entry with the acquisition of Resources Consultants Inc. (RCI), and soon after acquired SI International to become a Tier-1 Multibillion dollar leader in the U.S. Public Sector. The Borenstein Group is a Washington DC’s Top Digital Marketing Agency for Integrated Marketing Communications. We develop Brand Strategy, Brand Design and Brand Content for emerging and market-leading IT, Professional Services, Federal Contractors, Business Services, as well as Public Sector markets. As a stellar creative agency, with 25 years of experience, Borenstein is ranked at Chief Marketer’s Top 50 B2B Agencies, Clutch’s Top Digital Branding Agencies, Expertise’ Top Advertising Agencies, and Washington Business Journal’s Top Advertising Agencies the Washington DC region. Call us at 703.385.8178 x1 for a no-obligation strategic assessment of your digital brand. Copyright 2019 Borenstein Group. All Rights Reserved.